We’d love your help. Let us know what’s wrong with this preview of The Fleece & Fiber Sourcebook by Deborah Robson. To ask other readers questions about The Fleece & Fiber Sourcebook, please sign up. It took me months to skim through this & I can't say I retained much of it save that it's a great reference on various fleeces & fibers. It's broken up into types, usually by animal & then breed. Each sort has a good, descriptive blurb about the animal & the fiber. It's fun as a coffee table book & certainly helped me figure out which fleeces to even look at. Not done yet, but can already tell it's 5 stars. Brilliantly thorough survey of sheep breeds and fleece and fiber characteristics across the spectrum of animal fibers. If you spin, knit or weave....buy it. What an amazing book!! If there was ever anything you wanted to know about fiber or fleece - anything about wool - this is the book in which to find it! Written in an easy-to-read format with lots of side-bars with interesting facts, I never seem to want to put it down. This is a must-have for anyone who works with fiber - either the production of or in any kind of craft or hobby. Okay, working on getting this book categorized correctly. I'm the author. Yes, I think it's five-stars good, although I was going for ten and ran out of time! Huge, encyclopedic guide to all types of fiber animals. This volume features hundreds of full-color photos of the animals and how their fiber looks at various stages in the journey from "sheep to swatch." A must-have reference for spinners and other fiber artists interested in branching out from the mainstream all-merino all-the-time offerings at the LYS. I read non-fiction before sleeping. This is set up with a few pages per source, just enough to occupy my running thoughts. There is a picture of the lock, spun fiber and knitted swatch. Very accessible writing with helpful descriptions. Absolutely the best guide out there for breed specific wool! Great information on the sheep, the fleece, knitting and spinning. Gorgeous pictures. It's the one book I NEED for my spinning. This book is an amazing book! It is huge! It cover everything you need to know about all the different fleeces and fibers you can spin on a spinning wheel into yarns, threads, and more. I believe the author named this book what they did today because if she were to name it Spinning, most of you would associate it with bicycles today! Nope. She is referring to the old-fashioned Spinning Wheel. This book is a must-read book and is so educational. You will learn what our ancestors did before there This book is an amazing book! It is huge! It cover everything you need to know about all the different fleeces and fibers you can spin on a spinning wheel into yarns, threads, and more. I believe the author named this book what they did today because if she were to name it Spinning, most of you would associate it with bicycles today! Nope. She is referring to the old-fashioned Spinning Wheel. This book is a must-read book and is so educational. You will learn what our ancestors did before there were stores where we could just purchase wool and other fiber items off the shelf. Yes, spinning wool and other fibers involves a lot of work, but when you have the finished product, it is divine! I have my late mother's spinning wheel. Yes, she got heavily into spinning. On that spinning wheel, there is a long tail of wool she spun. I also inherited a lot of bags of wool. Unfortunately, I have now found out I am allergic to it and cannot even touch it! So I keep the spinning wheel as a remembrance of my mother spinning, and will have to find people who are interested in the bags and bags of wool she has. I had gone on many a trips with her to purchase the wool from different farmers. Believe it or not, this craft is very active, and wool and other fibers from animals are very sought after, even today. These farms are very close to where I live! I was so surprised! There is a good certain monotony to spinning. It gives you a lot of time to just get lost in the art of the project, or to pray, or to think about life in general, or whatever your certain thing to do would be while doing it. Spinning involves the whole body. You use your foot to make the wheel spin around, and you use both hands to craft the right amount of fiber into what you are trying to make. The more fiber you use, the thicker the resulting yarn or threads will turn out. I always liked to watch my mom spin and see the different looks on her face, and try to guess what she could be thinking about. I honestly think she enjoyed the overall experience. I cannot begin to tell you everything that is covered in this book. I sure had fun reading it. I should have done the review immediately after I finished the book, and now I am sorry I did not, but, I can tell you it is a fleece and fiber lover's dream come true! I had a little difficulty writing the review because it was so close to my mother's passing, that I am just now able to write this review. I didn't really catch on to exactly what this book was about, nor did I think it would bother me to read it when I did, but it did, especially after finding out it is all about Spinning. Now the book has expired from NetGalley, so I don't have it to refer back to it. I am giving you what I remember from the book. 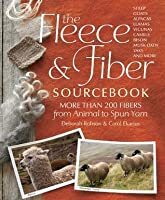 This book talks about the different fleeces and fibers available from the many different animals, from sheep, to rabbits, and many more! OH! The animal on the cover of the book, on the lower left hand corner! I cannot think of the name of that animal! Yes! It's fibers are wanted as well! Can you believe it? I was shocked when I found that out! There are many farms with those animals on them, too. The author gets into talking about cleaning the different fibers, to the brushes used to brush them, and many more of the different tools needed for the different techniques needed to use these fleeces and fibers, etc. The author takes us into spinning these items as well. She shows us how to do it, gives us suggestions and more. For anyone interested in Spinning, this is THE book to have! Even if you might be interested in learning what it is about, even how it works, it's worth checking out at the library if you don't want to invest in the Spinning Wheel, or don't know if it's for you. This is "the" book for fleeces and fibers. You will enjoy it immensely! Overall: I found this book very enlightening and useful. I am a crocheter so learning about yarns I use is kind of a fun side hobby. This book was easy to follow and there was a great deal of information to look through. What I Found Useful: The index made the Fleece and Fiber Sourcebook a good reference book. It was broken into 2 sections: Sheep and Other Wool Sources. Then the types were broken down by region and type of animal (sheep). I found this really helpful when looking up some of my favorite yarns and the type of mixes they were. The information was both informative and fun to learn. There is something freeing about knowing what is in the yarn that I use, especially since branching out into making clothing. This is a quality resource that has been detrimental on my spending cash. I started spinning with a drop spindle and watched Deborah Robson's free mini class called Know Your Wool on the Craftsy website. I had to get this book. The uninitiated have no idea about the varieties of fleece and fibers that one can spin into yarn. Common and exotic sounding names fill the pages and I'm beginning to sound like an expert in my need to collect some different varieties. As much as I lust for qiviut, it This is a quality resource that has been detrimental on my spending cash. I started spinning with a drop spindle and watched Deborah Robson's free mini class called Know Your Wool on the Craftsy website. I had to get this book. The uninitiated have no idea about the varieties of fleece and fibers that one can spin into yarn. Common and exotic sounding names fill the pages and I'm beginning to sound like an expert in my need to collect some different varieties. As much as I lust for qiviut, it will be some time until I get my hands of this fine fiber. Each entry is very complete with animal information, sidebars, and photos. I like that the writers included a photo with each entry showing the raw and cleaned fleece or fiber along with yarn samples and knitted, woven or crocheted pieces. Ms. Robson and Ms. Ekarius provide information for dyeing, fiber prep for spinning, characteristics of the yarn and best uses for the yarn. 5 stars as a reference book. This book is incredible. Everything you could ever need to know about sheep breeds and types of fibers (as well as any other animal that you could possibly spin fiber from). Hundreds of kinds of sheep, plus rabbits and alpacas and even yaks. It's awesome. I've already used it several times this week while researching sheep breeds of fleeces I'm interested in buying. I can't fathom the amount of work that went into researching this book. It's amazing. :) I basically re 5 stars as a reference book. What a joy this book was! I reference it often. I am a spinner/knitter/dyer and have been playing around with different local breeds of sheep. This book has helped me in so many ways! I can pull a sample from my fiber stash, compare it to the very helpful (and numerous) pictures of samples. It helps me identify which breed in a cross-bred animal is more present in the fiber, and how to go about preparing it and spinning it. A treasured book. Comprehensive and beautiful photos and illustrations throughout. Overview of many different animals and plants that people use to make useful things in our lives. Reference and coffee table book. Great gift for any knitter, spinner, weaver, etc. in your life. Good quality paper and binding. Need to buy and reread. In my opinion, one of the best sources of information about fiber for spinning or even for knitting and how to use it. It is beautifully printed and written and I've read it cover to cover, twice (and got Deb to sign it). I can't say enough about what an invaluable resource this is for information about fiber, especially about wool. This book is a must for hand-spinners. Comprehensive overview of breeds of sheep and many other animals around the world. Photos of each type animals, fiber, yarn, plus a knit and a woven swatch for each breed. How did they get this done? Authors gave historical information and other interesting tidbits of information. This is a large, heavy book but fasinating to study. If you're into yarn, this book is like a dream. Funny and super-informative. The pictures are beautiful and the index makes everything easy to find. I didn't know there are feral sheep. An excellent resource! encyclopedic resource of sheep breeds for the handspinner / knitter / weaver / fiber crafter. i've really enjoyed looking up breeds that i've been spinning, and those that i'm considering for a larger purchase. A book that every spinner or person interested in raising sheep should have on their shelf. Very well done. Tells about every breed of sheep, gives pictures of fiber and spun fiber, and micron count and all that good info for each breed. Enjoyable to read, lots of pictures and examples of the many breeds of sheep. Lacking a localized focus so it did not help me identify the wool I recently received, but pretty to look and informative all the same. I find myself going back to this book often! So much useful information for spinners – beginners to advanced. A helpful resource for planning your projects from the first spin of the wheel to the final stitch of a finished piece. Beautiful, well researched, amazing reference. I love it and I'm not really interested in fiber arts! Bought because I want to learn more about sheep breeds for my knitting. This is a reference book. Like an interesting textbook. I especially liked learning about the non-sheep fibers- like Alpaca, Camel, and Angora. Amazing, incredible, fascinating, and very well written. The ultimate guide to fiber and fiber producing animals. Awesome. I'm so glad I bought this book. an excellent resource. I hope there is a volume 2 with more sheep breeds, especially those from continental Europe.